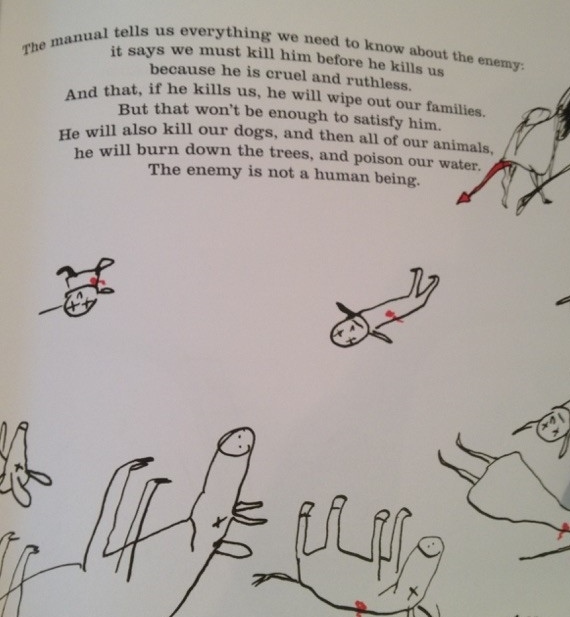 The Enemy by Swedish author Davide Cali and published in Australia by @wilkinsfarago is a unique picturebook that I stumbled across while processing the special orders @KKBOttawa this past week. When I unpacked The Enemy from the box I was at first completely mesmerized. What was this strange book? Who is the intended audience? What’s the message? The Enemy primarily follows one soldier, sitting in his hole in the ground waiting for the enemy, who sits across a field in a hole of his own, to make a move. It is clear almost immediately that the our character’s point of view is mirrored by the other soldier – both hide, both are lonesome worrying about their food and water and grasping at memories of loved ones and, most importantly, their training and their manuals. “We both stay hidden the rest of the day, waiting. Even when I’m hungry, I wait. I do not make a cooking fire. The enemy could sneak up when I’m not looking and kill me. But sometimes I am so hungry I light my fire. As soon as I do, the enemy lights his. The unknown to the lowly soldier, is as vast as the white space on the page – and it’s so clearly un-illustrated. I think the blank page could also signify just how impressionable these soliders are out there in the cold, what do they have to believe in but the war they are forced into fighting? But the manual that keeps them company? They are, like children are often thought to be, tabula rasa. Indeed, it is what the soldiers are taught that is the focus of the book, they are told that each other are monsters, no better than animals, that they will do anything kill each other. 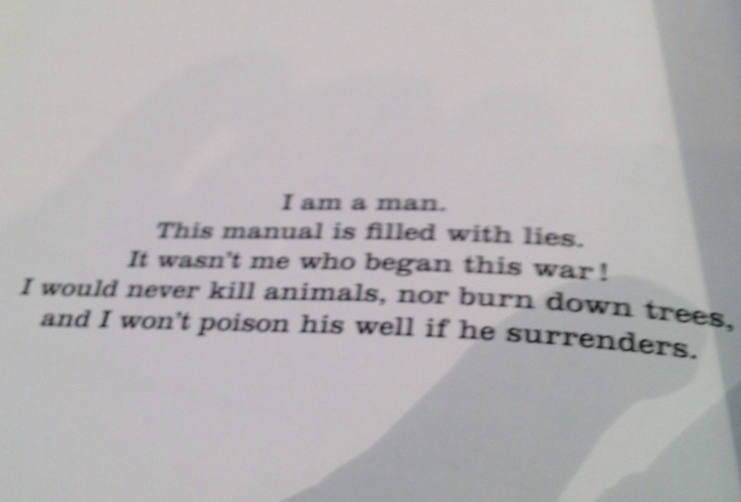 Eventually our lonely soldiers puts on his disguise and heads over to the enemy hole to have it out with him once and for all… but he discovers that the enemy also has a family, he also has war manual that paints the enemy as inhumane. Perhaps the enemy isn’t the other soldier but himself. But that can’t be, we know that our character isn’t the enemy, but then – is the enemy the enemy? 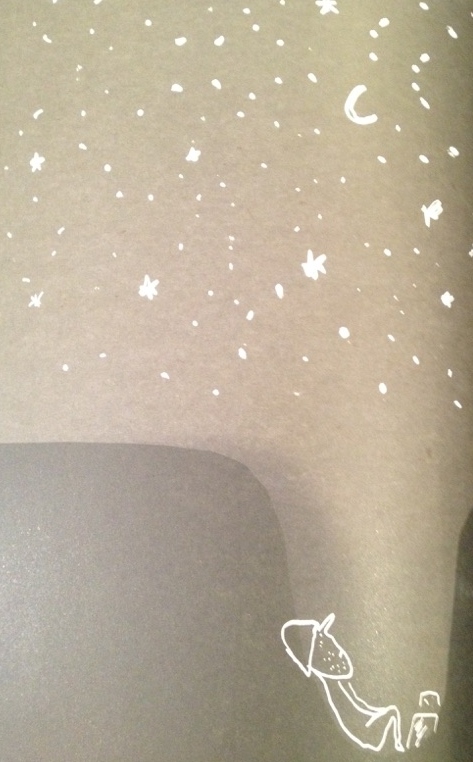 After I read the book and took my snapshots I was a little worried. In children’s retail this kind of books doesn’t often sell itself like cute kittens and squirrels and penguins. This is very experimental and expressionist and incredibly subtle. I wasn’t surprised to learn that a teacher had special ordered this book, and that she knew exactly what she was going to do with it. Perhaps this book might find a place on the shelves of some homes, it certainly merits being on the shelves of many homes, but it certainly belongs in classrooms. Education is a central theme of the book, and bringing this book into the classroom really opens up a delicate discussion of propaganda, messages, the use of media; it opens up discussions about what it means to be human and at war, what is war good for, why is there war? While many reviews point out that this book is for adults and not necessarily children, I have to disagree. I think this is an important truth that children needs to tackle, perhaps with the help of adults. The Enemy, in the end, is a beautiful representation of the coldness and futility of war and the fact that, when it comes down to it, we are all just human. I think that, to counter or compliment, the contemporary moment’s fascination with the dystopia and Hunger Games in specific this picturebook is a valuable tool for opening up difficult discussions in the minds of the future generation.